Mangaluru, Jan 19, 2016 : Sri Samyamindra Theertha Swamiji, the anointed disciple of Srimad Sudhindra T heertha Swamiji will take charge as the next Head of the Kashi Mutt Samsthan of the GSB Communit y on January 28, consequent upon the sad demise of the senior pontiff on January 17, Sunday. Bhajans and other rituals will be held in various shrines of the GSB community from January 26 to 28. Sri Samyamindra Theertha will take over as head of the Mutt at a ceremony to be held at Sri Kashi Mutt premises at Haridwar. He will be the 21st Guru of the Kashi Mutt. As already reported, the mortal remains of the senior pontiff were laid to rest at Haridwar. Several rituals and other post-funeral rites will be held for the next 13 days at Haridwar. On January 18, Monday all GSB business establishments and educational institutions in Dakshina Kannada, Udupi and Kasargod districts, remained closed as a mark of respect to the departed seer. 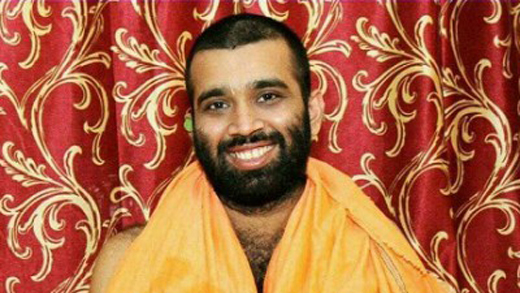 Shri Samyamindra Thirtha Swamiji is the disciple (patta shishya) and successor (uttaradhikari) of the Kashi Math. He is the 21st successive person called the swamiji of guru parampara. Previously known as Sri Umesh Mallan, he was singled out after casting a total of 48 horoscopes as his constellation paved the merited way to characteristics to become a pontiff. When the ‘vatu’ was selected he was studying 2nd year B.Com in Lakshmi College in Paravoor. Being the youngest in his family, Sri Umesh Mallan’s ambition was to join the army and serve the country. His father, Sri Surendra Mallan worked as a stenographer at Kakanad Naval Physical Oceanography Laboratory in Cochin. His elder brother Sri Suresh Mallan has been working for a Bank. H.H Shrimath Sudhindra Thirtha Swamiji, Mathadhipati of Shree Kashi Math Samsthan initiated him into Sanyas on the banks of the Holy River Ganga. The sanyas Dhiksha ceremony took place in Sri Vyasa Ashram (Haridwar Shri Kashi Math) on the day of Jyeshta Shuddha Dashami, 20th June 2002 and the Yati was named Shrimath Samyamindra Thirtha Swamiji. The proclamation was put into effect by H.H Shrimath Sudhindra Thirtha Swamiji on the day of Vyasa Jayanthi (Guru Poornima). Jai Gurudev. Bless the entire GSB community. The elderly seer Guru Sudhindra has offered Samayindra Swami Sanyasa Deekha. Being our Guru’s follower our respect and we expect the same . Wish the prosperity of the humans on the whole. Gurubhyo Namaha. We respect the decisions of the Kashi Mutt and consider Samaymindra Swami as our Guru. But our devotion to our past Sudhindra Swamiji will remain in the hearts.